Home > Video > We were absolutely delighted with the service we received. London Translations helped us deliver subtitling for a high profile video to one of our most important international clients. A serious communications project with a tight timeline and complex messaging, we needed a company that combined professionalism with a flexible approach. Expertise in terms of account management and the actual translation was second-to-none. Our clients were extremely satisfied with the end product and this would not have been possible without the first-class support provided. 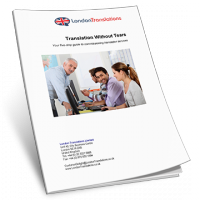 We have no hesitation in recommending London Translations to other production companies and will certainly be using them again in future.